Every Vedic Rishi has declared Poverty, or दारिद्र्यं (Daaridryam), as the greatest disease, or व्याधि Vyaadhi, capable of crippling not just the body but also the mind. The objective of Vedic education, therefore, was to primarily ensure Prosperity, or संमृद्धि (Samriddhim). Since most of the Vedic ॠषि Rishis (authors of Vedic texts) lived away from civilization, in the woods, a great many tend to wrongly assume “suffering poverty” to be a “Vedic ideal.” Nothing can be farther from the truth. Neither did the Vedic Rishis glorified poverty nor did they demonize wealth. A great many of the Rishis were the ones who lived a financially affluent life before renouncing it all of their own volition to become hermits and renunciates. Valmiki, the celebrated author of Ramayana, was a dreaded dacoit named Ratnakara, who accumulated great wealth before renouncing his criminal ways to becoming a rishi, Bhartrihari and Vishwamitra were powerful kings who relinquished their throne by choice to become hermit Rishis. It is very important to note that none of the Vedic Rishis were born in abject poverty. These two suffer great pain, namely: a poor person filled with desires and the powerless person with abject anger. Where are friends when penniless? Where is happiness without friends? All are pointing to the fact that poverty is pain and not something to be glorified. From knowledge comes humility; from humility comes worthiness; with worthiness one attains wealth; with wealth one can perform his duties, and in performing his duties, one attains happiness. I may be born as a slave or may be born into poverty. Where I am born, or to whom I am born are beyond my control. But these factors can seldom determine my future or limit the scope of my achievements. Poverty is exclusively owing to your Karma, or actions, and never destiny. To be wealthy, one must first understand wealth. And that understanding comes only through Gyana or knowledge. Therefore, Gyana is the primary wealth whereas Wisdom is known as absolute wealth. According to the Rishis Jnana is that which satisfies our material needs. If knowledge cannot find us a way of sustenance, then that knowledge isn’t knowledge at all. They are either data or information. Most often forget that Data is raw, unorganized facts. When the data is processed, organized and structured it becomes information. Knowledge not only implies understanding the difference between data and information, but also concern about their applicability and shortcomings. Books provide us with data and information. However, it becomes knowledge only when someone assimilates and understands it. If you are literate, it’s possible for you to read all the books in the world without ever understanding them. Data and information provided in books become ‘knowledge’ only when an individual grasp it in a way as to find its application in day to day life. “Bookish knowledge” is verily data or information, untested by personal experience and of little utility in life. Here is ancient Vedic folklore that puts the thing in perspective. A pompous scholar who had significant information about Vedic texts including Vedas, Upanishads and the like was traveling across a river on a boat. To spend time, he decided to have a conversation with a fellow traveler. “Have you read Vedas?” he asked. The traveler replied, “I have heard about them but never found time to read them.” “Is that so? Then your 25% of life is wasted!” declared the scholar before firing another question. “Have you read Upanishads?” “No,” said the traveler. “Then another 25% of your life is wasted!” declared the scholar. Soon the boatman shouted, “There’s a crack in the hull, and the boat will be sinking soon!” “Do you know how to swim?” asked the traveler to the scholar. “I was so immersed in the knowledge of the Vedic texts that I never found time to learn swimming.” “Then your entire life is now going to be wasted.” came the curt answer from the traveler. According to Rishis (Vedic sages), knowledge must always have a practical application. Without practical application, it is information or data at best. The internet has become a jumble of data and information with statistics, personal anecdotes, opinions, and facts, which lack context, citations, and disclaimers. Most “facts” are seldom unsubstantiated by experience, time or context to become known. Unless one can find the utility of facts through some application, they do not become known. What follows from knowledge is wisdom. Wisdom is then the ability one gets through knowledge. Wisdom enables one to see things in data and information, i.e., possibilities and drawbacks that most people can’t. Currently, our education as a process that hinges upon getting into a good institution, gaining a lot of information and data and then regurgitating the same on answer sheets. While the original thought is valued, it is mostly only found in the higher realms of postgraduate and doctoral degrees. For the most part, education is a means of gaining a skill set to attain livelihood, which relies on learning and memory. निधिद्यासन् Nidhidhyasan or continuously assessment of memorized data and information through application, experience, and retrospection. Today मंत्र mantras are considered by many to be a word or sound repeated to aid concentration in meditation, as a Vedic hymn or even a statement or a slogan repeated frequently. Mantras during the Vedic era were a system by which realized knowledge was turned into a hymn for students to memorize easily. Students would then reflect on the mantras and then develop their understanding. This was at all levels of education. The thinking process was inculcated from the beginning. We must remember that it was a time when printing technology had not even been conceived. There were neither pen nor books to take notes. Mantras (which were essentially poems) were easier to memorize as well as recollect. According to the Vedic Rishis, unless a person remembers the information and data without distortion or personal bias, the true understanding or knowledge would never be possible. Therefore, students were made to memorize the mantra (hymns) before explaining them by the शिक्षक् Shikshak (teacher), आचार्य Acharya (professor) or गुरु Guru (Mentor) to शिष्य Shishya (student). The गुरुशिष्य परंपरा Guru-Shishya Parampara (tradition), which was the basis of education, was essentially in place not only because in absence of printing technology books weren’t available easily, but also because books on their own cannot explain fine nuances and can be open to misinterpretation without relevant context. So, a Shishya (student) would have to seek refuge in a Shikshak, Acharya or Guru to learn anything that (s)he may so desire. One must spend every effort in earning wealth and every second in gaining knowledge. Without effort, there’s no wealth, and without proper utilization of time, there can be no knowledge. The bookish knowledge and our money lent to others. In the time of need, neither that knowledge nor that money will come in handy. So, the imperative here is on having knowledge that can provide us ways for sustenance and wisdom that can yield us mental peace to attain Artha or wealth which is not just currency. Therefore, it’s important to understand the Vedic concept of wealth. Vedic rishis in Vedas also refer to Wealth as Lakshmi. Lakshmi is not simply the “Goddess” depicted in temples across the country. Although this science certainly inspired the image of the Goddess, Lakshmi in the real sense is the Vedic science of wealth that enables people to understand, attain & sustain abundance and prosperity, at both outer and inner levels of life. The word Lakshmi comes from the Sanskrit terms: lakṣ and lakṣa – meaning “to perceive, observe, know, understand” and “goal, aim, objective,” respectively. The word Lakshmi is better understood as knowing and following one’s goal. Lakshmi finds mention in Rig Veda only once, but the related term Sri is common for wealth and abundance. In Yajur Veda and Atharva Veda, Lakshmi becomes a complex concept with plural manifestations. Vedic teachings define four primary objectives for human life, namely: धर्म Dharma (Duty), अर्थ Artha (Wealth), काम Kama (Desire) and मोक्ष Moksha (Liberation). It suggests that an individual must address one’s desires during youthful years and then become detached and strive towards liberation as one grows old. Liberation is best attained with full renunciation but to renounce one must have achieved something in the first place. 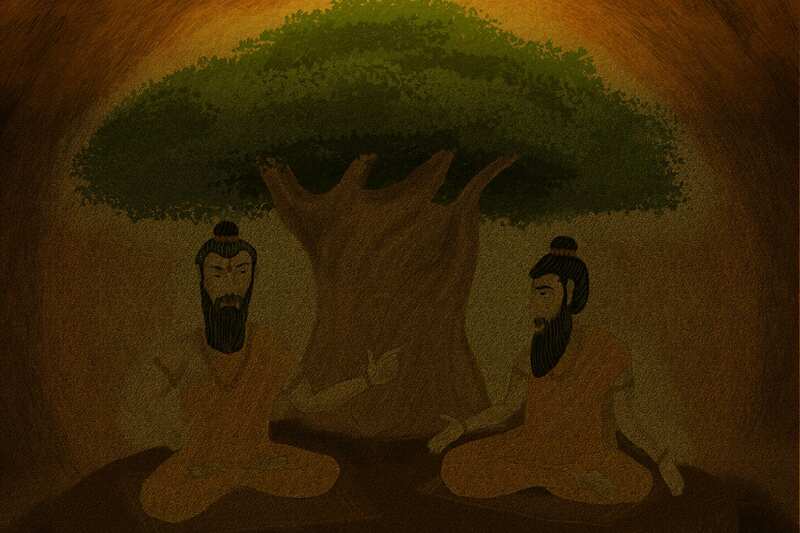 Although Moksha is not earnestly sought after by many people today; Artha and Kama are eagerly sought by the majority of people, often without any concern for either Dharma or Moksha. आदिलक्ष्मि Adi Lakshmi (Primary wealth): No matter how, where and when you are born you have some wealth and resources with you. Primarily this is your health, family, culture, and education. Vedic teachings say that you must first be aware of what you have, then understand how to build on it for further wealth. If you do not know what you already have – you will never understand what you need to get or how to achieve it We often find that people who complain, cry and curse their “fate” remain losers in life. Those who work without complaints or doubts, on the other hand, make great strides and go far, regardless of the unfortunate circumstances they may have to face. Adi means first, so the first step for wealth is to understand yourself, then the people and things immediately around you. धान्यलक्ष्मि Dhanya Lakshmi (Wealth of Grains): With the money, you can buy the necessary food to give you physical strength and vitality for more significant efforts in life. वीरलक्ष्मि Veera Lakshmi (Wealth of Courage): With your body strong and knowledge and money by your side, to attain greater abundance in life you must have the courage and be willing to exert yourself. It takes great courage to achieve something that people around you consider you are incapable of achieving. By having knowledge, food, and money with you already, you are in a better position to attain the wealth of courage. गजलक्ष्मिGaja Lakshmi (wealth of power and prestige): Through the appropriate application of knowledge, money, food, and courage – the wealth of power becomes accessible to you. This power can be social, political, intellectual or even spiritual, allowing you to influence the world for good or bad. सन्तानलक्ष्मि Santana Lakshmi(wealth of offspring): With knowledge, money, food, courage, and power you are in a better position to take of others and gain a following to have a progeny (Sanatana) in the broader sense of the term. It is only by having the right progeny that you can create a sustainable family as well as a supportive society, allowing your influence in the world to be perpetuated. So, you seek Santana Lakshmi. एश्वर्यलक्ष्मि Aishwarya Lakshmi(Wealth of affluence and endowment): Having a following it becomes necessary that you provide them with adequate resources to secure their future. You can be a helpful benefactor using the wealth that you have acquired. For this, you ask and work towards Aishwarya Lakshmi. You can help bring the wealth of Lakshmi to others. विजयलक्ष्मि Vijaya Lakshmi(Wealth of victory): Once you’ve attained the previous seven aspects of Lakshmi, you are in a great position to pursue anything in life, and Vijaya Lakshmi is all by your side in your pursuits. You can overcome all opposition and go beyond every obstacle. You can even conquer your desires. There can seldom be any comparison between the wise sages and the kings. The king no matter how powerful and rich is respected only in his kingdom whereas the wise are respected everywhere. If you give a million to an individual bereft of knowledge it would only be a matter of time before (s)he spends it all. On the contrary, an individual born into poverty but armed with knowledge and persistence can earn greater riches. There is no point in brooding about the past or worrying about the future — the wise only concern with the present. It is not a crime to commit mistakes, because we are humans. Mistakes make us human. But it is stupid to repeat the same mistake. To ensure that we don’t repeat our mistakes we must learn from others as well as our past. But learning from the past doesn’t mean brooding about it. It is all about looking at our past actions without any emotions attached to it. Similarly, there is no sense in worry about our future. There’s nothing to be achieved by worrying about it. But we can certainly choose, and do, the right times for our future to have the right impact. Therefore, if you want to be untouched, or to get out of financial insolvency, then first stop cribbing or brooding about the past and, also, worrying about the future. Detach yourself of all emotions – good and bad. Become indifferent and look at your problems as if they aren’t yours. Clear your mind and then look at the world around you find opportunities. Ideate and strategize ways to exploit those opportunities. Stay focused on finding solutions. Follow this with persistence, and you’ll duly find yourself out of the troubles. Seldom discuss your problems with those who cannot give you a productive perspective. There’s nothing to yield from talking to people who can only cry along with you. Also, never think that just because people around you are poor, you too will be poor. That is the silly mentality of the animals living in herds. We, humans, were never meant to be a part of the herd. Also, the history can testify to the fact that every time we’ve taken the herd mentality, by rallying behind despots and dictators we’ve only invited the worst. It also doesn’t help to compare yourself with others. Comparison is the silliest thing an intelligent being can do. Always know always that you are unique. Your body, mind, and capabilities are dissimilar to anyone and everyone around you. You don’t get happiness in earning, achieving or realizing something. You earn, achieve and realize once you are happy with your self and work for things you desire. Yoga is seeking excellence in everything and anything we do. 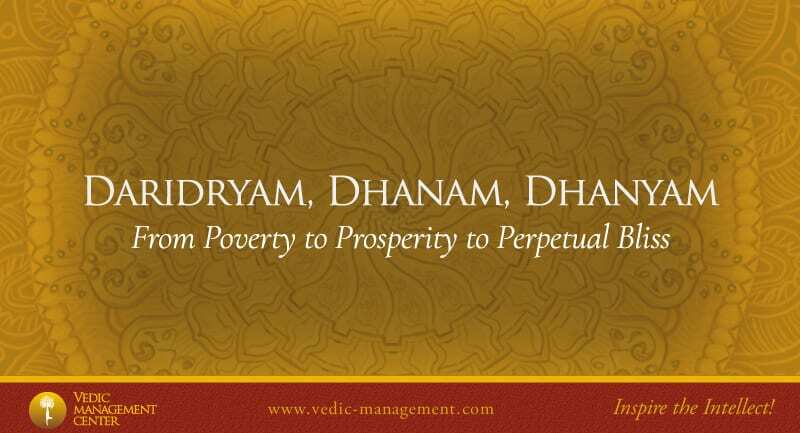 0 responses on "Daridryam, Dhanam & Dhanyam: From Poverty to Prosperity to Perpetual Bliss"